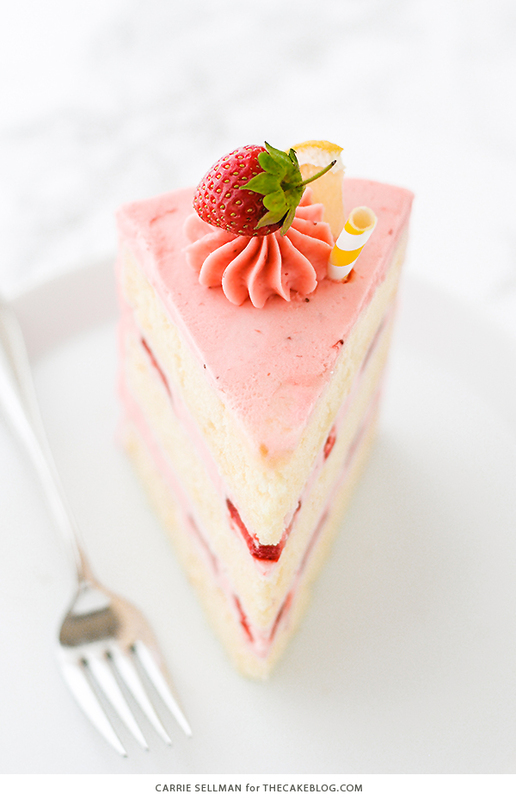 Strawberry Lemonade Cake. 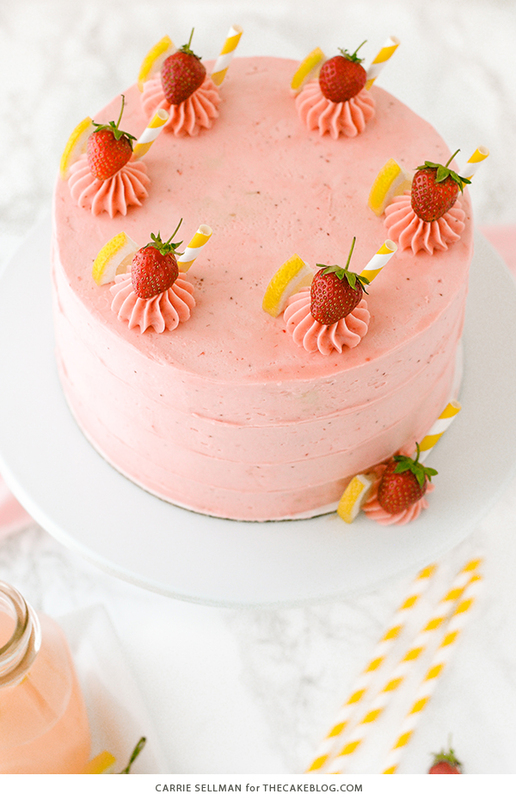 A tender layer cake recipe brightened with lemon juice, lemon zest and fresh strawberries, frosted with a tangy sweet fresh strawberry buttercream frosting. Last summer I shared my favorite Lemon Blueberry Cake and while it’s always been a hit in our house, it quickly became a reader favorite too. So many of you have given it a try and left your feedback. Thank you! Turns out, one of the most commonly asked questions on this recipe is about subbing strawberries, as in, can I substitute the blueberries with strawberries? And while I completely understand the desire for a lemon and strawberry combo, the truth is that swapping these berries is not as easy as making a straight substitution. So after our strawberry picking adventure (read about that here) I decided to make a strawberry version of the lemon blueberry cake! Tart and sweet, tangy and fresh, this cake is summer at its best. The lemon cake is tender with a boost of lemon that’s pronounced but not too sour, with visible flecks of zest and extra lemon notes from a dash of extract. Then comes the strawberry frosting, the real star of this show. Fresh strawberries are simmered with a splash of lemon juice and some sugar, removing all of the excess liquid and creating the most intense strawberry reduction. When it’s added to our buttercream, the result is all the strawberry flavor you want without all the excess moisture that will ruin a frosting in no time flat. While I also love using freeze dried berries for an intense berry frosting (like in this recipe), today’s frosting is all about using the fresh berry bounty that summer brings. 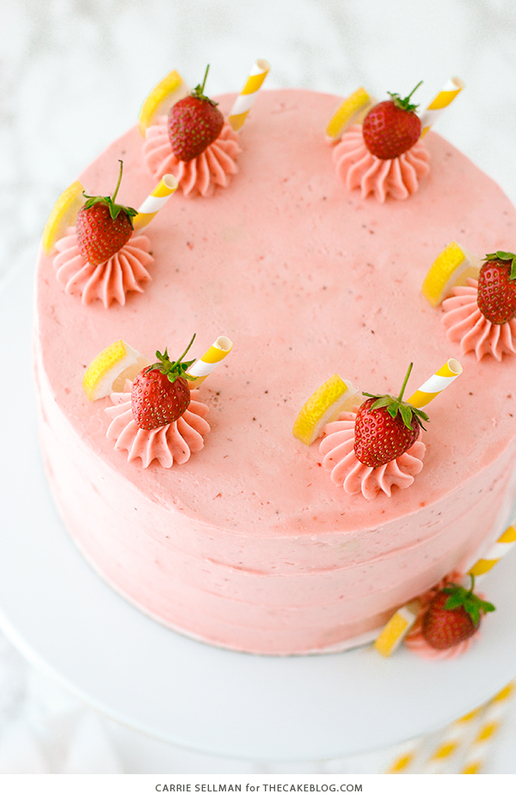 The tartness of the fresh strawberries tones down the sweetness of a classic crusting buttercream, creating the perfect balance that’s neither too sugary nor too sour. Plus, its natural color is pretty easy on the eyes. Between the layers of cake, sandwiched right in the middle of the frosting, is an extra layer of sliced strawberries. 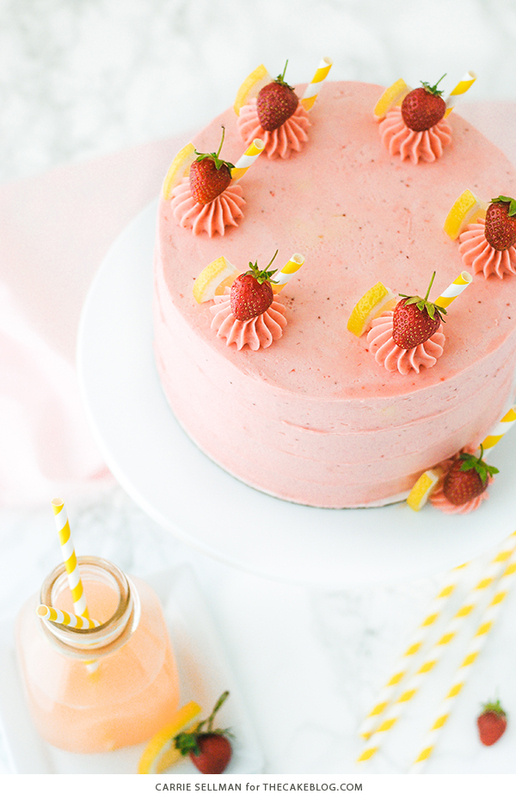 They really enhance the fresh strawberry flavor and add that extra pop of red that visually reminds us… this cake is a celebration of fresh berries. 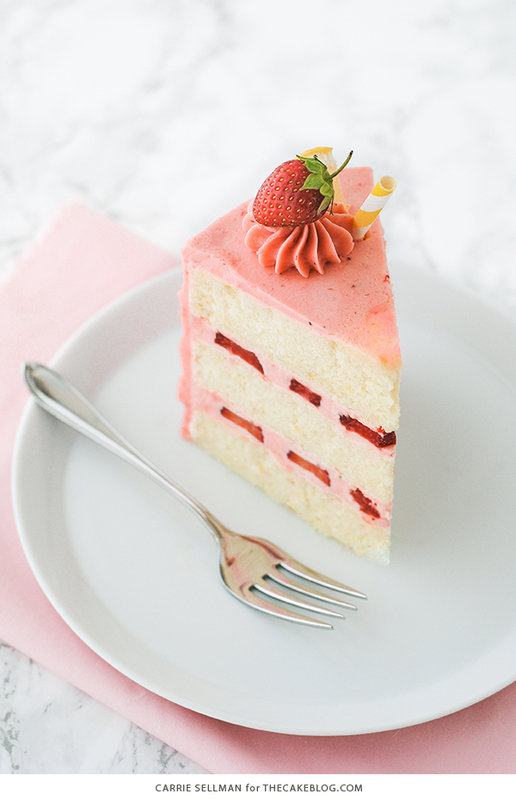 The key to adding the strawberry slices without extra liquid seeping out and ruining the cake texture or presentation is simply a little planning. Slice the strawberries a day in advance and lay them out on a baking tray lined with paper towels. Cover with another layer of paper towels and refrigerate overnight. When it comes time to assemble the cake, you’ll have beautiful fresh strawberry slices that won’t release too many juices. Simply spread a thin layer of frosting, top with the prepared strawberry slices, then cover with another thin layer of frosting. The strawberries will be completely surrounded by buttercream and not touching the cake itself, helping it remain as beautiful as it is tasty. If you don’t have time to dry the strawberry slices overnight, I suggest skipping them all together. I hope you enjoy this one as much as we did! Cheers to the start of some summer fun! Tender layer cake recipe brightened with lemon juice, lemon zest and fresh strawberries, frosted with a tangy sweet fresh strawberry buttercream frosting. Preheat oven to 350. Butter and lightly flour three 8″ round pans. Line with parchment paper circles. Sift together 3 cups cake flour, baking powder, salt and lemon zest. Set aside. In a small bowl, combine milk and lemon juice. Stir to combine and set aside for milk to curdle. This is similar to making homemade buttermilk! In the bowl of a stand mixer, beat butter and sugar on medium-high using the paddle attachment. Beat until pale and fluffy, about 4 minutes. With the mixer on low, add eggs one at a time. Mix well after each egg. Add vanilla extract and lemon extract. Mix to combine. Add the flour mixture in three batches, alternating with the milk, beginning and ending with the flour mixture. Do not over mix. Stop the mixer and scrape down the bowl and mixing blade. Divide batter evenly between the three 8″ round pans. Bake for 28-30 minutes, until toothpick inserted into center comes out clean. Let cool in pans for 10 to 15 minutes, then remove to wire rack to finish cooling. Combine strawberries, sugar and lemon juice in a sauté pan over medium heat. Cook 25 minutes until the juices are bubbly and the berries are soft enough to smash with the back of a spoon. Press the mixture through a fine mesh strainer into a clean bowl to remove the seeds. Use the back of your wooden spoon to really press as much pulp through as you can. Scrape the underside of the strainer to get all of the accumulated strawberry pulp. Discard seeds and return strained puree back to the pan. Cook on medium-low, stirring with a wooden spoon, until reduced to only ¼ cup remains, about 5 to 10 minutes. Pour into a small bowl and cover with plastic wrap, pushing the plastic down to touch the strawberry reduction so that a skin does not form. Allow to cool. In bowl of stand mixer fitted with the paddle attachment, beat butter and salt until creamy. Add vanilla extract and cooled strawberry reduction. Mix well. Gradually add confectioner’s sugar 1 cup at a time, mix and scrape down sides of bowl as necessary. Whip on medium-high for several minutes until smooth and fluffy. Remove ½ cup of frosting from the mixing bowl and reserve for decoration. 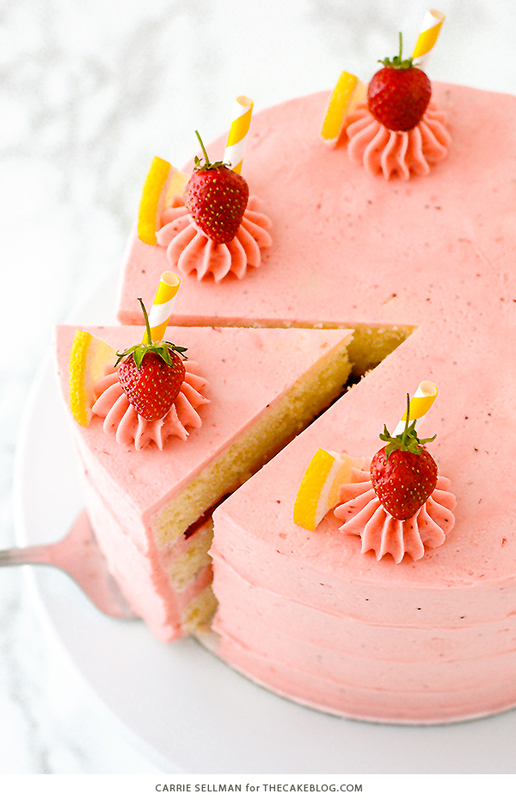 Place one layer of cake onto serving plate or cake stand and top with ½ cup of strawberry frosting. Arrange a layer of strawberry slices on top of the frosting, leaving some space between each slice so that the slices are not touching. 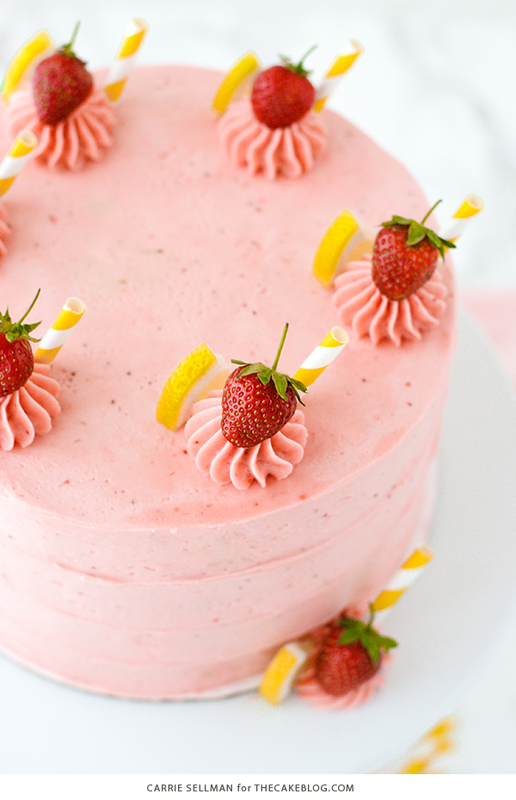 Spread another ½ cup of strawberry frosting on top, using your spatula to push the frosting down around the strawberry slices, so they are completely enclosed in frosting. Repeat with second cake layer, more frosting, strawberries and frosting. Top with the last layer of cake. Crumb coat and frost cake with remaining frosting. Pipe 6 swirls of frosting onto the cake using a French star pastry tip. Refrigerate cake for 5 minutes for the swirls to set. Decorate with lemon slices, whole strawberries and paper straws, if desired. Store in refrigerator. Serve at room temperature. You may bake this as two full-sized 8″ round cake layers. Alternatively, I baked it as three intentionally shorter 8″ round layers – this saves time and effort because the shorter layers do not need to be torted. If frosting loses air or becomes sparse while assembling the cake, whip it again to add air back in and increase volume. 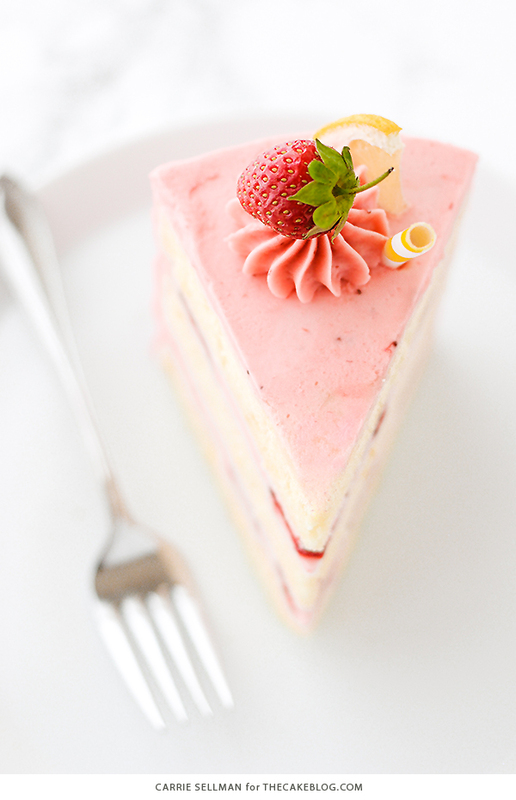 It is important to remove excess liquid from the strawberry slices used between the cake layers. Do this by slicing them and laying them out on a baking sheet between two layers of paper towels. Refrigerate overnight. Carefully remove strawberry slices from paper towels when ready to assemble your cake. For an even thicker or sweeter frosting, add additional confectioners’ sugar as desired. Beautiful cake! I’m planning to use this recipe soon! It seems perfect for summer. One question: can the lemon extract be substituted with extra lemon juice? Or maybe leave it out altogether? I don’t think I can get my hands on lemon extract but don’t want to forgo this recipe just because of that! Completely understand Laila! If you can’t find lemon extract, you could simply omit it or substitute some additional lemon zest in its place. The extract enhances the lemon flavor, but the cake will still be delicious without it. Enjoy! This is one gorgeous cake! Thank you Sandra! It’s pretty yummy too! This is gorgeous and looks so delicious! Prepping the strawberries beforehand is a great idea. Strawberry/lemon is just so perfect for summer! Thanks Melissa! Reducing the fresh berries really gives the frosting that kick of strawberry that says… summer is here! OMG this cake looks gorgeous! It’s a strawberry dream. :3 I will try to make it for my mother’s birthday! She’ll love it! Hope she loves it Victoria – happy birthday to her! I made this for my daughter’s birthday last week. Everyone loved it! My mom said the icing was “phenomenal.” I agree! I’ll be making this again. Thank you! Thanks for the feedback Laura – so glad you all enjoyed! Since you are using lemon juice and milk could I just use buttermilk which I have in the fridge? Also do you make SMB for some of your cakes and if so do you bring the sugar/water up to 160 degrees? Some bakers just cook it until it’s smooth to the touch but I wonder how safe that is? You could substitute buttermilk but you will lose some of the lemon flavor, since the cake itself is the main lemon component. As for SMBC, yes, all of our recipes call for the egg white mixture to be heated to 160 F to ensure that any bacteria in the raw egg is killed off. I made this for a BBQ over the weekend and it disappeared so fast I didn’t even get to try it. But all of my guests said it was delicious! Thanks so much! So happy to hear! Thanks for your feedback Emily! Love the tip on the strawberries laying them out in advance..very helpful! The layers of this cake look gorgeous! Thank you Trish! And yes, the lemon cake is firm enough to stack. Enjoy! I made this cake for my granddaughters 1st birthday. The strawberry reduction really works to enhance the wonderful flavor in the frosting. Don’t be tempted to use it all- Carrie suggested the perfect amount for that just right flavor. Delicious cake. Easy to do in steps. I made this cake for my stepdaughter’s birthday. The frosting was absolutely wonderful, I will definitely use it again, although I ended up making another half recipe of it to have enough to thoroughly ice the cake. Fortunately there was enough strawberry reduction to do so. I also really liked the idea of drying out the strawberries used in the filling, that worked very well. However, the cake itself came out quite dry, and I baked it two minutes less than the minimum amount of time suggested. If I do this in the future I may use another lemon cake recipe or reevaluate baking time or the amount of flour for a moister cake. The frosting is great and the flavors go well together so I hope future adaptations make it as good as it could be. I used your recipe for the lemon blueberry cake for my daughter’s 5th birthday. Now she wants strawberry for her 6th, so I’m planning on using this, since I know how well the lemon cake turns out. We don’t usually care much for buttercream, though. Would it be good with strawberry cream cheese frosting or might that be too sweet? So happy to hear your family enjoyed the lemon blueberry cake! Personally I love the tang of a cream cheese frosting — but for this recipe, I decided to skip the cream cheese. The combination of the strawberry reduction and the cream cheese resulted in a frosting that was just too soft to properly fill and frost the cake. Plus I really wanted the strawberry flavor to stand out. The reduction really packs a punch and tones down sweetness of the buttercream nicely. Hi, I’d like to make this as a birthday cake, but the child’s mom wants a fairly large decoration on top, so the cake needs to be a 9×13. Is that possible with this recipe? Thanks for your help. Loved this cake! It’s a bit more involved than I usually make, but it’s worth it. I made an extra half recipe of icing so I could use a texture comb and pipe some succulents for the top. I also did one tsp vanilla and 1 tsp lemon extract in the frosting to get more lemon flavor.